Raja Ampat or 'Four Kings' is the name given to these islands. A name derived from a local myth. The four main islands in question are Waigeo, Salawati, Batanta, Misool who is the producer of the ancient rock paintings. Underwater tours lovers from around the world flocked to it to enjoy the best underwater scenery in the world are amazing. Two days earlier, when you're in a crowded Bali wrapped in sacred art as well as catching a plane to the head end of New Guinea birds. Furthermore, be prepared for an unforgettable adventure. Start your tour from here to dive under the sea is the most beautiful. Explore the underwater vertical walls that. Feel the tension also diving, palpitations while vacillating ocean currents. 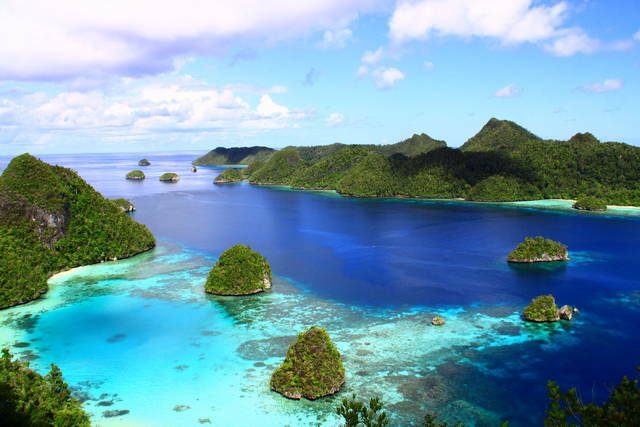 That certainly will be an unforgettable personal experience in Raja Ampat. Area of ​​the islands in the Raja Ampat is very broad, covering 4.6 million hectares of land and sea. This is where the home to 540 species of coral, 1511 species of fish and 700 species of molluscs. Biota wealth has made ​​Raja Ampat as a library collection of coral reef life and most diverse marine life in the world. In fact, according to a report by The Nature Conservancy and Conservation International, there are about 75% of the world's marine species live in this amazing island. Raja Ampat scene like in a dream but this is not an illusion. When you plunge dive into the underwater marine life with a detailed look at the greeting. It could be a dwarf seahorse close your fingers as if to greet shaking hands. Mantaray and wobbegong will swim with you. Tuna, giant trevaliies, snapper, barracuda and even helped to welcome you at the bottom of the sea. That was not enough, what if there is a new friend who is friendly dugong fish want to swim with you. Do not miss too busy watching the little fish back and forth to keep its territory. If you are lucky may be able to swim with sea turtles. Natural beauty, as if absolutely untouched has been the main attraction here. No need to phrase the beauty of the sky is blue or lush verdant island, because what lies beneath the land and the sea will tell you "Welcome to Raja Ampat; this is heaven's richest tropical marine biodiversity in the world today.